DUBAI, UAE – Minister of Youth, Sports and Culture the Hon. 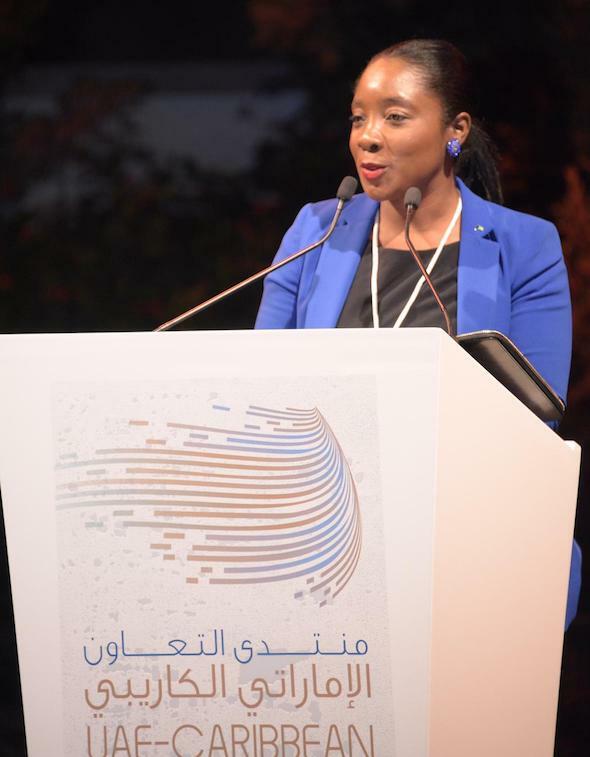 Lanisha Rolle gave a brief taste of the topic of Bahamian culture to the delegates and distinguished guests in attendance at the First United Arab Emirates Caribbean Cooperation Forum, in the city of Dubai, on November 24, 2018. Minister Rolle also thanked the organizers for their invitation, warm hospitality, and for the opportunity to share with on the topic. She pointed out that it would be it would be remiss of her if she were not to boast of the thing that all Bahamians say, ‘identify us’ and brings everyone together: Junkanoo. Minister Rolle began by giving a brief talk on Junkanoo and termed it “The Bahamas’ premier cultural festival”. “The Junkanoo Parade is a collection of cultural expressions inclusive of fine arts, native music and the work of local artists,” she noted during her talk. “Every aspect of the parade is unique, from the creation of giant 30-foot costumes made from local card board and crepe paper, to the manufacturing of drums made from goat-skin harvested on our very islands, to the unique Afro-Caribbean dance and sounds that create a spirit that inspires Bahamian pride and an atmosphere of jubilance. Minister Rolle pointed out that, worthy of mention, was the industry’s efforts to include Bahamian youth in the rich cultural experience. “As a part of our strategic cultural succession plan, for 30 years we have developed a Junior Junkanoo Program as a feeder system and strategic tool to educate our school children regarding the value of our heritage and the culture of our ancestors,” she said. She then gave a brief introduction to “good island food”, saying that The Bahamas is also known for its rich cuisine inclusive of the delicacies of native conch, lobster and fish, all organically grown in its waters. She pointed out that it was customary to eat at least three meals per day, and prepare great feasts during Christmas holidays, and a spread for adult birthday celebrations. Indicative of the Caribbean and Latin American countries, foods prepared in The Bahamas are normally seasoned and spicy, she added. Minister Rolle stated that freedom of religion is a fundamental right guaranteed under the Constitution of The Bahamas and that citizens, visitors and residents are free to exercise their religious belief. Minister Rolle noted that some forces that influence Bahamian cultural platform include climate change, irregular migration and poaching. “While we recognize that these problems are not unique to The Bahamas, we appreciate the need for countries to work collaboratively to ensure the preservation of our cultural identity,” she said. “Fellow Delegates, ironically and quite significantly, my Ministry’s theme for our 2018 National Cultural Month in December is: ‘The Root, The Tree, The Fruit’, a theme which speaks holistically to the essence of our Bahamian/Caribbean Culture,” she said. “On that note, on behalf of the Government of The Bahamas and in my capacity as the Minister of Youth, Sports and Culture, I wish to congratulate this honourable body on a successful cooperative forum, and look forward to the fruits that will bear from the seeds planted during this inaugural conference.